It only takes one slip to turn an otherwise great day into a horrible day spent in the ER. For the most part I have been able to stay clear of those nasty injuries – knock on wood – but accidents can happen at any time. The most obvious way I know of to keep all your body parts attached, is to keep them as far away from moving parts as possible. This is reason for push sticks, push blocks, etc; but for those extra small parts, the Rockler Small Piece Holder has you covered. The idea behind the Small Piece Holder is simple, you turn a small hard to handle piece of wood into a larger piece with handles. It features a quick release for fast clamping, because we all know that if it isn't easy to use, it will end up with a permanent home at the bottom of a drawer. 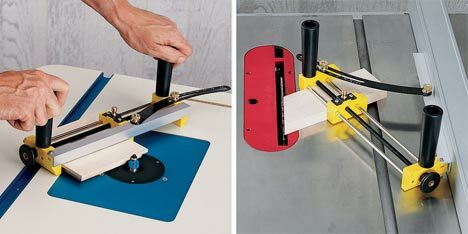 It looks like the small parts holder really shines for use with a router table, but it really can be used on just about any piece of power equipment. It even has a swing out arm that allows for angle cuts up to 45 degrees while riding against a rip fence. For just under $25 it seems like a good finger saver.